In the beginning, I had a Comcast cable modem attached to my AirPort Extreme Base Station. All worked well. At least reasonably well. Most of the time. But the time came when Comcast informed me that, if I wanted the higher speeds Comcast was promising, I needed to upgrade my modem to a DOCSIS 3.0 model. I readily agreed. A Comcast rep offered me an SMC Wireless Gateway, which is a combination of modem and router. I hesitated at first, claiming that all that I really needed was a new modem. But the rep told me that, if I ever wanted to add Comcast voice (which, in truth, I had no intention of doing), I would need the Gateway. For some reason, I reluctantly agreed. As the SMC Gateway is a router, it largely duplicated the functions of my AirPort Base Station. In fact, if I were so inclined, it would be possible to disconnect the Base Station and depend solely on the Gateway. I was not so inclined. The upgrade process was not as simple as merely swapping the modem for the Gateway. Both devices use NAT to share a single IP address. This double NAT configuration is not a recommended configuration. To avoid this situation, the quick solution was to put the AirPort Base Station in "bridge mode." This meant that the Base Station would serve as a passive transfer point, leaving the main routing functions to the SMC device. Actually, I would still use the Base Station to route to my AirPort Express devices and other peripherals. But the Gateway would assign the IP addresses. To make this change, I launched AirPort Utility, accessed my Base Station settings and went to Internet -> Internet Connection. 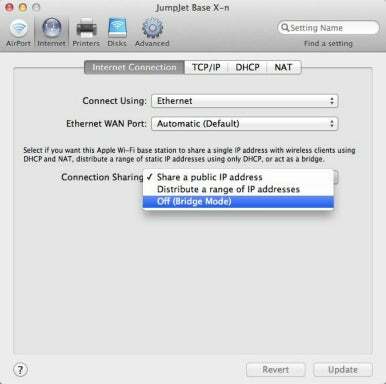 From the Connection Sharing menu, I changed "Share a public iP address" to "Off (Bridge Mode)." That did the trick. I was on the Internet again. And yes, I was now getting the faster download and upload speeds I had been promised. All was well—except for a few oddities that popped up now and then. With the Base Station in bridge mode, AirPort Utility no longer offered a list of DHCP clients (as accessed from the Advanced -> Logging & Statistics section). The Gateway interface also provided no such list. While not a big deal, I did occasionally use this list to diagnose connection problems. In addition, I could not get OS X's Back to My Mac feature to work. As it turns out, Back to My Mac requires a router that supports either NAT-PMP or UPnP. It seemed that the Gateway supported UPnP, but I could not get it to play together with Back to My Mac. In the end, I simply preferred having the AirPort Base Station function as my main router again. So I decided to reverse the functions of the two devices. That is, I would put the SMC Gateway in bridge mode—so that it functionally became a "dumb" cable modem—and revert the Base Station to its prior IP Sharing mode. Changing the Base Station's settings was no problem. Changing the settings on the Gateway proved a more formidable task. As I learned (from reading forum threads on Comcast's web site), there is no way that an end user can put the Gateway in bridge mode. Rather, you have to call Comcast and have them do it for you. Further, unless you are lucky, you can expect to wind up speaking to Comcast reps that have no idea what you're talking about and who are ultimately unable to assist you. In my case, I was lucky. Although it required considerable waiting on hold, and being transferred to two different reps, I eventually wound up talking to someone who could—and did—make my requested settings change. Unfortunately, something remained amiss. I had no active Internet connection! In retrospect, I think the solution would have been to reset the Gateway. While I had briefly unplugged the Gateway, this was not sufficient—as the device has a battery backup that kicks in when it loses power. Rather, I should have used the device's reset button. I'll never know for sure if this would have worked—as I have since returned the device to Comcast. At the time, I did not think to try it and the Comcast rep did not suggest it. Instead, discouraged with the situation, I had the rep revert the Gateway back to its prior status, giving up on the bridge mode swap. Unwilling to abandon my ultimate goal, my next move was to dump the SMC Gateway altogether and exchange it for a cable modem. I could have had Comcast make the exchange. However, rather than continue to pay the $7.00/month in rental charges, I purchased my own cable modem: a DOCSIS 3.0 Motorola SURFboard eXtreme SB6121. I still needed to contact Comcast; they needed to make changes on their end before my newly connected modem was active. Once that was done, I again switched my AirPort Base Station out of bridge mode and restarted my Mac. Success! Everything now worked exactly as intended. My bottom line advice? If you have an AirPort Base Station (or intend to buy one) and you don't want Comcast's Voice feature, avoid getting their Gateway devices. In fact, avoid their cable modems as well. Buy your own compatible cable modem instead. You'll get the same performance but you'll be saving money within a year.